Last night I went out with my parents to see a stage production of the musical Mary Poppins. My husband stayed in to watch game 4 of the NBA finals. I think it was better that way. I just don’t watch basketball the same way he does. We watch the same activity and listen to the same commentary, but we don’t have the same responses, ask the same questions, get excited about the same things. He has read up on web commentary, he talks about team records and the number of leading players injured this year, he cares who wins. Because he knows the history, the stats, the personalities, and because he’s experienced years of playing and coaching basketball, he has the identity of a basketball fan; he’s a basketball insider. As teachers, we have the identity of practitioners of our subject areas, which is more than having an array of math, science, historical, or literary facts at our disposal. We read, write, and think in slightly different ways as mathematicians, scientists, historians, or readers of literature. And our job as teachers in our fields is not to pass on the facts, but to mentor students in the ways that people in our field read, write, and think, to help them develop their identities as readers, writers, and thinkers through specific disciplinary lenses. 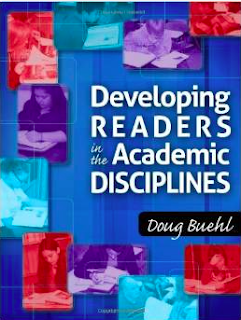 This is the argument of Doug Buehl in Developing Readers in the Academic Disciplines. Teaching students how to read the textbook of the discipline in such a way that they develop a sense of efficacy in building knowledge rather than dependence on the teacher to dispense knowledge. 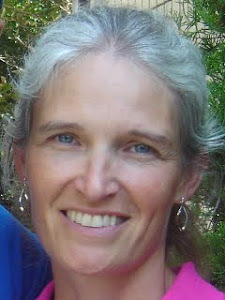 Teaching students how to engage in the discourse of the field—read the texts that practitioners of the discipline read (scientific journals, historical documents, statistical charts, or Pulitzer Prize winning novels) and respond to those texts in discussing, writing, and doing as practitioners of the discipline respond. This all involves motivation: practitioners of a discipline don’t DO reading to find the answers to questions assigned by someone else, they USE reading “as a point of personal access to knowledge and ideas that can inform actions and address questions” (166). Students who are asking their own questions will learn more, and students who are learning more will hone their reading, writing, and thinking. Literacies of the disciplines, as it is now called, is reading and writing across the disciplines refined. While there are general reading and writing skills, we tweak them differently as specialists. We all ask questions of our reading. For instance, historians ask who is recounting these facts for what purpose? Mathematicians couldn’t care less, as long as it works. Math and science textbooks rely heavily on students remembering past material and learning the new terms and concepts. Literature completely assumes mastery of technical terms of the discipline (from character to symbol to irony) never actually mentioned in the texts! On teaching students to read the textbook: I remember a high school teacher of mine assigning the reading of a textbook passage and promising a quiz the following day. I’d never been asked to read a science book that way before, and I had to work like never before to really master that content. The following day, class began with vociferous complaints from students who’d found the assignment too difficult. The quiz was postponed, and the teacher lectured through the chapter. I never had to read a science textbook again until college. More on teaching students to read the textbook: I remember my first college literature professor who began the second class asking whether there were any questions on the assigned short stories. No hands went up. So he said, “Okay then, moving on to tomorrow’s assignment…” and suddenly many hands shot up. If the rest of the students were like me, they had done the reading because it was assigned, and then come to class prepared to take notes on what the professor had to say about it. We had not been equipped to engage with literature as insiders ourselves. Building deep and flexible understanding—I love that description. It was what I knew I didn’t have in Algebra 2. I remember feeling like I’d grasped the concepts just by my fingernails by the end of the chapter, so that if nobody bumped me to dislodge anything, I’d probably remember it long enough to get through the test, but certainly no longer. I’d love to be in a discussion of this book with colleagues from across the disciplines—I need that practice and accountability to build it into my teaching, and I’d love to see what my colleagues would think about building it into theirs. And Buehl really does specifically address each discipline in each chapter, from ways of bridging academic knowledge gaps in each of the disciplines to self-questioning protocols for each of the disciplines (even differentiating between physical science and biology). How did you build your identity as a reader, writer, and thinker in your discipline? How will you apprentice your students next year into that identity? For some ideas, read the book. Then talk to someone about it. I’ll be talking about it a lot this summer.